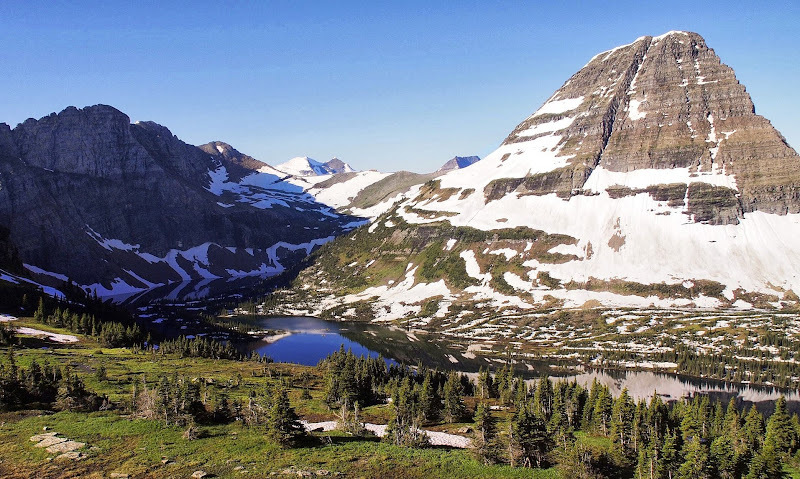 What Happened to the Glaciers in Glacier National Park? There was 1 question nagging me as I was researching our trip that would take through Glacier National Park and Canada What kind of name is “Going to the Sun” Road? This is the road that cuts Glacier National Park roughly into halves: top and bottom. The road takes you through some of the most spectacular scenery in Glacier National Park but it’s not particularly steep. It definitely doesn’t feel as if you’re going anywhere close to the sun. Then I found out that the road was actually named after a nearby mountain: Going-to-the-Sun Mountain. Which makes more sense, I guess. I was hoping to discover some exciting fact about the origin of this intriguing name. That wasn’t meant to be. Regardless of where the name came from, Going-to-the-Sun Road is worth all of its 50 meandering miles. We stopped by Logan Pass Visitor Center to hike the Hidden Lake trail which came highly recommended as one of the short day hikes you have to do in Glacier NP. Eager to stretch my legs, I jumped out and ran to the trailhead still in my Tevas. Little did I know that part of the trail was still covered by snow. Needless to say my toes weren’t too happy. Eventually they got too numb to even register the cold of the ice (and the subsequent icy water) that got between my toes and I continued my merry way until I found myself at the overlook of the hidden lake. Hidden Lake was nice… but nothing too spectacular. To be honest, the highlight of this hike was coming across a trio of marmots who were play-wrestling right by the trail. They were completely oblivious of me. At one point, one of them almost ran over my (numb) toes. As for Jack, the highlight was finding a path carved out of this snow-covered hill by the trail where he glissaded down to the cheering of a group of hikers who have gathered to watch him. As we continued driving along the cliff-hugging Going to the Sun road another question popped up in my head. Was I so naive to expect to see glaciers in Glacier National Park? We could see evidence of their existence: deep, u-shaped valleys carved millions of years ago by the ever-moving glaciers. But the only glacier we could spot from the road was Jackson Glacier… a tiny speck way up a mountain side. Later on I learned Glacier National Park is slowly losing its glaciers due to a global warming trend (here you can see comparison pictures). 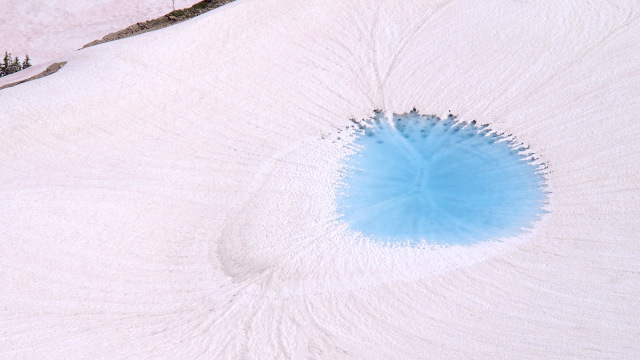 There are now 25 active glaciers, down from 150 in 1850. If the warming trend continues, there will be no more glaciers in Glacier NP by 2020. So that means you have about 7 years left to see any glaciers here. For now you can still see some glaciers in the Park from pretty close, you just have to work for it. One of the park’s most popular glaciers is the Grinnell Glacier which can be reached by a 5.5 mile trail. Little known fact: the rock in the park is some of the world’s oldest. There are no fossils embedded in the rock because it is older than most life on the planet. Glaciers or not, the park is beautiful in its own way with its craggy peaks, deep green valleys, hidden turquoise lakes, and massive cliffs. I can’t wait to show you more of this place, including one of the elusive glaciers of Glacier NP. 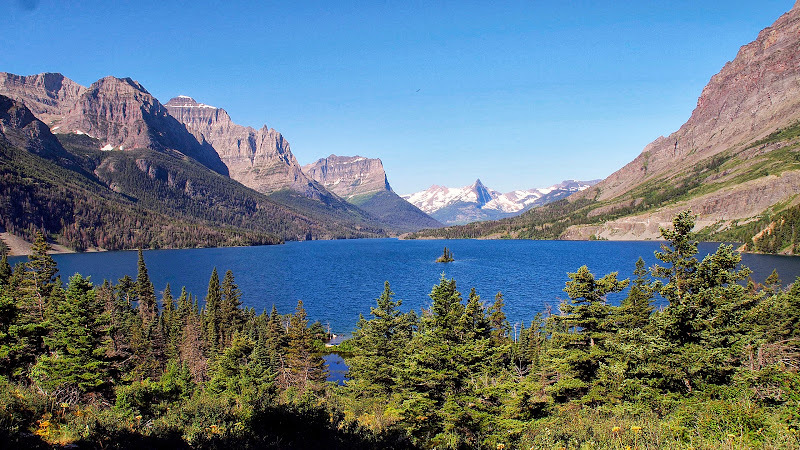 Would you come to Glacier NP to see glaciers? In the summer, campgrounds within the park get filled quickly. On our first day, we stayed in St. Mary Campground. The next day, we left around 6:30 am to secure a site at the very popular Many Glacier Campground. This page helped us predict when a campsite would run out of spots. The campgrounds here are very developed. The 2 that we stayed at have a restaurant, a hotel, a store, and shower facility nearby. Driving time of Going to the Sun road: 2 hours. My uncle lives by Glacier National Park. I really enjoy its scenery and mountain goats. Sadly, I live in Texas, most people in Texas think global warming is a myth. What can you expect from people who never really travelled…. We were in Glacier National Park about 3 months ago.. and we were also looking for the glaciers (quite obvious). We did see the tippy-top of some glacier, but hadn't we known that that was the spot (as marked from the view point) truth is we wouldn't have even almost distinguished that tiny bit of glacier from the rest of the mountain. A local was telling us how they expect the glacier to be 100% gone in a few years and she was concerned how that'll affect the local eco-system. My recent post Ditch your travel guidebook NOW: here are some free alternatives! I did not make it yet to Glacier NP but would love to go one day. I will need to hurry it looks like. It's such a shame that global warming is ruining so many beautiful natural places. In any case even without glaciers it looks like a stunning place. Such a beautiful place! One of my best days traveling (one of my best days ever) was hiking in this park, including a close encounter with a cougar and mountain goat. And ice bergs floating in the lake. Hi Jill, that's a so sad that the glacier are slowly disappearing. But you're right, the mountain still look svery spectacular without them. I would like to hike there one day. I'd also love to do what Jack did – to glissade down the the snowy hill:) Looks like a lot of fun! These are stunning pictures of a national park I have longed wanted to visit. I'm hoping we'll make it there in 7 years. That lake is absolutely beautiful and I'd also come just to see those adorable marmots. From the looks of your photos, Glacier NP is so worth a visit even if I'm not willing to hike out of the way to see the glaciers. Hidden Lake and St. Mary Lake…wow! So beautiful. What's really cool about Glacier is that a lot of their 'sights' are just short hike away from the road – or in the Going to the Sun Road it's actually the road itself. It is so sad to see all glaciers slowly but surely disappearing. I would love to visit the Perito Moreno glacier in Chile one day, as it is supposed to be spectacular too. I absolutely love Glacier, it's amazing to visit in the late fall once some show has hit, very beautiful. The name "Going to the Sun" comes from the native americans Blackfoot tribe that lived in the area in the late 1800's. Sun is one of their highest gods and they would pray to Sun at the top of that peak. American that was in the area with the natives heard the take and gave it the name "Going to the Sun Mountain". It's also said that the original Blackfoot name for the mountain is The-Face-of-Sour-Spirit-Who-Went-Back-to-The-Sun-After-His-Work-Was-Done Mountain because of what looks like a face in the mountain when looked at from the West. Wow, thank you so much for the information about the origin of the name of the road. Very interesting. So does 'Sun' refer to our sun or does it refer their God who happens to be called Sun? Or maybe both? Incredible post, thanks for sharing! It looks so beautiful there. I love national parks, but unfortunately I have only been to a few of them in this country. Glad you all got to see it before the "7 years". So would I. What the past glaciers have left behind (those deep, v-shaped valleys and the knife-edged ridges) are amazing on their own rights. I love Glacier NP. I've been many times and am looking forward to returning in 2015. As for me, I've seen enough glaciers in my time, I don't need to see more. That being said, I love hiking the trails there. What a wonderful post! I have not been to Glacier National Park, but I hope to one day. I guess I have to go soon! Great post – love Glacier… any time of year!